House Speaker Jaime Perelló, center, offers details of the meeting. A broad segment of the Puerto Rican diaspora and local economic and social organizations met Thursday with House Speaker Jaime Perelló to identified critical areas that must be addressed jointly in Congress, as it shapes solutions for the island’s fiscal crisis. Representatives from 13 groups defined what they called “points of collaboration” that following the meeting Perelló said must be delivered to Washington as a united front. The strategy calls for working together to establish a framework to restructure Puerto Rico’s $70 billion public debt and the necessary technical asistance to audit the obligations locally. The group will also pursue congressional action that consideres economic development measures including incentives to attract investments, among others. The group will also ask for parity in Medicare and Medicaid funding, something that has already been presented to Congress. Finally, the group said the message to Congress will be that austerity measures that affect Puerto Rico and the island’s productive sector should be excluded. Present at the meeting were representatives from: 32BJ Union; Hispanic Federation; Make the Road by Walking; Jubilee USA; Service Employee International Union; New York State Assembly; and the Hispanic Task Force. 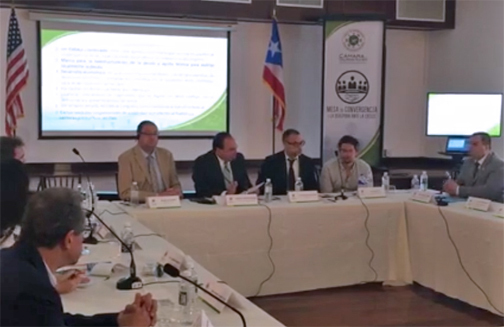 Local organizations included the Puerto Rico Chamber of Commerce, the United Retailers Association, the Puerto Rico Marketing, Industry and Food Distribution Chamber (known as MIDA), the CPA Association. Urban Outfitters opening at The Mall of San Juan in Sept.
Hey Buddy!, I found this information for you: "Diaspora, local execs join forces on message to Congress". Here is the website link: https://newsismybusiness.com/diaspora-local-execs-join-forces-on-message-to-congress/. Thank you.